Instant cameras used to be a dead trend for a while but again these cameras have started capturing camera market and it’s becoming a popular trend especially among teenagers. But the problem is if you want to buy this type of camera then you need to know some important facts about these camera models. Because if you don’t you might end up with a camera which would be useless for you because of expensive film prices. Sometimes you can find a camera for very cheap but then film for it might not be available in the market anymore. Even if the film available then each photo print would cost you more than $4-$5! Here keep reading this article if you want to Which camera is the best for you. You might wonder why do you need one of these cameras when there are high-quality camera photos, Tabs and many types of compact digital cameras. Well if you are looking for a camera to take quality photos then you are in the wrong place. These cameras are not for the quality and never known for quality. One cool use of this camera is, let’s say you want to make a guest book for an event like a wedding or other kind of party? Rather than renting an expensive PhotoBooth you can use one of these cameras because it’s cheaper and easy to use. You can make an amazing wedding guest book with instant photos of those guests with their wishes. it will be a great treasure for the wedding couple. These are the latest instant cams from Polaroid. With these cameras, you can now save all those photos into the memory card and move those to your mobile or other devices like a computer or laptop. Also one of the biggest advantages is you can choose which photos to print and discard bad quality images. You won’t be wasting photo paper for useless photos anymore. Need to use new Film packs called ZeroInk. Older analog models like Type 600, SX-70 and Spectra don’t need batteries since Film pack comes with batteries. You don’t need batteries for these. New Polaroid models use Lithium rechargeable batteries. Instax models use AA batteries or RC2 Batteries. You should use rechargeable AA or CR2 batteries because these will be cost effective and last longer. Instant Cameras and Polaroid Cameras? The most popular name for these cameras is Polaroid Camera. That’s because for over 50 years only Polaroid Co. made these instant photo cameras no other company. So when you called instant film cameras it means all models from every brand unlike before. In early 80s Kodak tried to enter this market with their own model but Polaroid went to court and stopped it. Then in the early 90s, Fujifilm started making these cameras with Polaroids permission and they are now making better quality cameras than Polaroid itself. American scientist Edwin Land is the creator of first commercial instant film camera 1948 which was known as Land camera. It was he who started the Polaroid Co. which had the monopoly in this camera market for so many decades. Polaroid Camera becomes a huge hit in the 60s and 70s with their popular models like Polaroid SX-70, Polaroid 600, Polaroid Spectra and 100 Series Pack cameras. In 2008 they stopped making all Polaroid analog instant photo cameras and film to focus on Digital instant photo cameras. This was a huge blow for Polaroid camera fans because they ended up with cameras with no film available. Only a few got lucky because the company called Impossible Project started making the instant film for few models like 600 series, SX-70 Series and Spectra series. Some of those type 100 pack cameras can use Fujifilm instant film and rest because simply useless. Old Polaroid film packs are still available in some camera stores but these are very expensive. For example type 600 film pack cost you around $50 just for 10 photo papers. Also, there is no grantee these old expired film packs would work and even if these work you will end up with several dud photos in each pack. If you already have a Polaroid camera then only the best option you have in finding if Impossible project group make the film for your camera mode. If not then you are doomed. Expired film packs might work but older these packs get lesser then chances those might work. Cheaper to buy a new camera and trying to get one of those old cameras to fix. When Polaroid shut down their camera and film production in 2008 February, Dr. Florian Kaps, André Bosman, and Marwan Saba had decided to start a company so they can make an instant film for these abandon cameras. In October 2008, they have started Impossible Project Co. and bought Polaroid film machinery from Polaroids Netherlands factory. By 2010 they have started making several types of film from the machinery they were able to salvage. Now you can buy instant film for Polaroid 600 series, Polaroid SX-70 series and Polaroid Spectra series cameras from Impossible Project Co. Their products are available on their website, Amazon online store and also they have offices in Vienna, Berlin, New York, and Tokyo. Cost of these film is around $3-$4 per exposure. Even it’s still expensive these are the only alternative film you can get for old Polaroid cameras. Fujifilm has started making their own Instant film cameras from the early 90s. First, they were only allowed to sell cameras in areas Polaroid don’t have a market or sell cameras. But later when Polaroid stopped production Fujifilm expanded into North America and Europe and their models started doing very well because of the cheaper price and the quality in photos. Fujifilm Instax 210 was their first best seller of Instax series but the model which capture the market is Fujifilm Instax Mini 7s cameras. Even Polaroid re-branded it and sold in North America and Europe as Polaroid 300. Since then they are just focusing on this Instax Miniseries. There are already 5 Instax Mini cameras released to the market by Fujifilm. 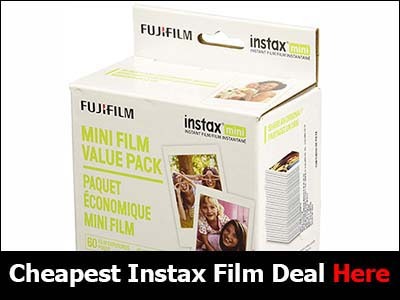 The cheapest option out there is the market is also a Fujifilm Instax camera. That’s Instax Mini 8 camera which comes at five colors and price from $65 to $80 depending on color. It’s very small size camera and lightweight, powered by 2 AA batteries. This camera is better than All Polaroid options in the market. With 2 pairs of rechargeable batteries, You can have loads of fun whole day long regardless it’s outdoor or indoors. Their 5th Mini camera in this series is Fujifilm Instax Mini 90s camera which probably is the pinnacle of their instant photo camera line. This camera is the best camera in the market and has more manual settings than any other instant photo cameras in history. It also uses Fujifilm Instax mini film just like other Instax cameras. This camera has some great features like Bulb and double exposures, macro mode, and high performance flash, brightness settings and even a viewfinder. You can find a pretty good price for this at Amazon. Fujifilm has launched another two new Instax cameras in 2014. Their new Instax Mini Hello Kitty camera is available in stores since November. This camera is released for the 80th anniversary of Fujifilm and 40th anniversary of HelloKitty. It’s the same old Mini 8 but with HelloKitty our design. This Instax Hello Kitty cheap even though it’s kind of limited edition. Fujifilm is predicting they will sell millions of these in Asia alone. Instax 300 is the successor of Instax 210 and available in shops since March 2015. No huge difference in technology but Instax 300 is lighter in weight & has a slimmer and nicer look. It uses Instax Wide film just like Instax 210. Price of the camera going to be less than$150. It might not be a good choice as an upgrade from Instax 210 because both have the same lens and controls. Also if you are looking for the cheapest Instant film camera and don’t mind bulky build then 210 is the best option since it’s still only around $60. Many Instax fans say they are disappointed about this camera since there are no major improvements in photo quality or in controls. So most of those who already have Instax 210 camera wouldn’t want to upgrade. Polaroid launched an instant mobile printer called PoGo which they also released as the camera which has 5 megapixel CCD sensor. 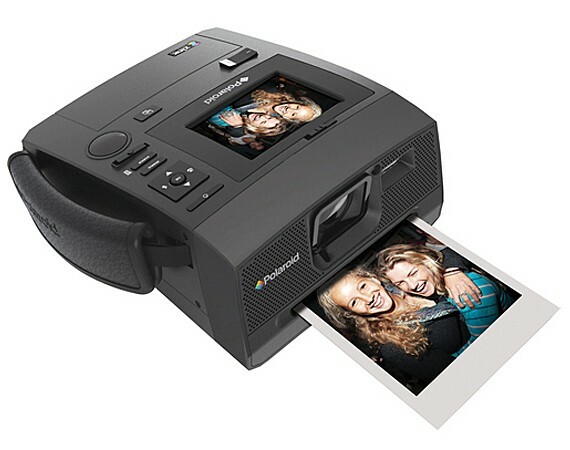 Polaroid GL10 is the 3×4 format photo paper printer which is little bigger than Pogo model. These Instant printers priced a lot cheaper but for some reason, they have raised prices. FujiFilm also has a model which is listed on Amazon. It’s called Fujifilm Instax Share Smartphone Printer SP-1. It might bet better quality than both Polaroid Printers.